LOOK AT US NOW, MOTHER! is an unflinching look at the complex bond between mother and daughter. It has its roots in My Nose, a humorous short in which Gayle Kirschenbaum introduced us to her hypercritical mother, Mildred, as she pressed Gayle to have a nose job! The film barely scratched the surface of what was clearly a fascinating and perhaps universal story of mothers and daughters. 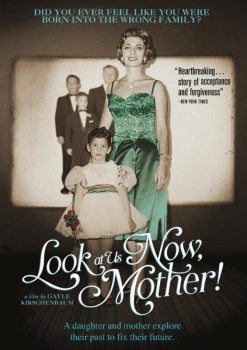 So, Kirschenbaum embarked on a long, miraculous and poignant journey for the full-length film LOOK AT US NOW, MOTHER! In the midst of shooting, Gayle's father died, changing the dynamics of her relationship with Mildred. They head off alone together and start traveling the world. Gayle keeps cameras on as they move through countries, continents, time zones - and emotional minefields. What ultimately emerges is a uniquely cinematic, courageous and intimate family study with both humor and pathos in the midst of conflicts and affections that bind mother and daughter. Told with biting humor and raw honesty. As these two formidable women the bumpy road of discovery, their relationship changes before our eyes and teaches us a universal lesson: the power of forgiveness. Writer/Director/Producer, Gayle Kirschenbaum is probably most well known for her 2004 film, "A Dog's Life: A Dogamentary" but her new film, "Look at Us Now, Mother!" is sure to over take the top spot. It is certainly her most personal film, a documentary about her turbulent relationship with her mother, Mildred Kirschenbaum. Gayle does a great job at telling her and her mother's story but even more importantly she does a terrific job at telling her entire family story going all the way back to when her mother as just a young girl. We all know how family can be and to be honest I felt really bad for Gayle at times during the film because of her mother being so critical of her. For example she is always telling Gayle that her nose is too big. I thought otherwise, Gayle is a beautiful and talented woman that doesn't need to change a thing. The relationship never reached "mommy dearest" status but I can only imagine how hurtful it must have been at times. Something else I found kind of sad was that it took the death of her father for her and her mother to finally get closer. Don't get me wrong here, the film is not a total downer and her mother is quite funny at times but it is still uncomfortable at times, at least it was for me. Ultimately the film is about forgiveness and finding the understanding needed so that the two of them could finally embrace each other. "Look at Us Now, Mother!" is a fascinating look at just one mother and daughter relationship, it’s at times tough to watch but in the end it was a fun, engaging and even inspiring film that was unique and well-worth seeing. The film is available not on HD digital platforms and DVD from Virgil Films so be sure to check it out if you like a good documentary.